What is VPN Software & What is it Used For? A VPN, or Virtual Private Network, is designed to conceal your IP address so that you may browse the Internet anonymously. Rather than just block your real IP address, a VPN client connects you to a remote server and assigns you another. That way when a service or individual pings your IP address, all they will see is the IP address of the remote VPN server. As we already mentioned, VPN software is used to browse the Internet, or use different Websites and services anonymously. It can also be used to browse a Website that’s been blocked in your country. For example, you can connect to a remote IP address from another country, and then connect to the blocked domain or IP. Quite simply put, a VPN is just a collection of computers networked together. 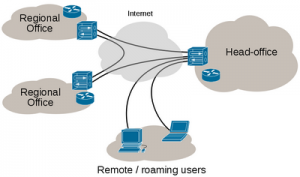 To use a VPN, your home or local computer connects remotely to a server. A VPN service has many uses. It can be used to browse the Internet anonymously, or visit a locally blocked domain. It can also be used to maintain a secure connection to the Internet, or in other words connect to sensitive Websites or services. Whatever reason you’re using a VPN, there’s essentially one thing that you want to keep in mind. A VPN secures your Internet connection and encrypts all data and traffic filtered through it, which means your entire browsing experience is invisible to prying eyes or parties. That doesn’t mean you are totally protected from harmful Internet sites, though. You should still use a virus scanner, and spyware or malware software for added protection. In some cases, a VPN can even give you a false sense of security, so it’s extremely essential that you still pay attention to download sources and places you visit. Anonymous Internet browsing does not necessarily mean invisible in the case of some VPNs. There are several VPN services that keep detailed logs of your activity, and your assigned IP addresses. In the event that the related service is court ordered to hand over logs, many will comply. Such services clearly do not take your browsing privacy as seriously as others. Remember this when choosing a VPN service to use. I only review VPN services I have access to and use myself. Some honorable mentions, include OpenVPN, BTGuard, Private Internet Access, Proxy.sh, TorGuard, Privacy.io, Anonine, and more. The best way to find a VPN service that works for you is to try it out. Honestly, the VPN game is quite competitive, which means the providers are willing to fight “dirty” in order to get that extra buck. That means you can’t always believe everything you read on an official VPN site about other providers. It’s necessary to note that some VPN services don’t take your privacy as seriously as others. For example, there are a couple services that keep logs of your activities during your connection time. These logs can then be used against you later as legal evidence. Then again, if you comply with your ISP’s terms of service you shouldn’t have to worry too much about legal ramifications. It’s also possible to set up your own personal VPN using software like Hamachi and Privoxy, but such a system requires you to setup the network manually. VPN services generally do all the work for you, and come with client software in order to take care all the necessary network tweaks. We recommend using HideMyAss, because of its incredible ease of use and advanced software, which also happens to be extremely user friendly. HMA does keep detailed logs of your IP assignments, however it does not log your traffic. It is possible to keep track of traffic going to a remote IP, and then distinguish who an IP was assigned to through those logs, however. HideMyAss also offers a free Web proxy service. Many believe that security and privacy are more of a geeky concern. This isn’t right at all, everyone should be concerned with such issues. I earnestly recommend a VPN service for anyone that uses the Internet. Sure, there are some specific reasons for using a VPN, but the real value here is that a VPN securely protects all Internet communication and data. Once someone gets your IP address, they can pretty much find your exact location and identity. It’s unbelievable how much information just a single address can hold. The IP may not hold such information directly, but with it anyone can look up the related information. A VPN will provide you with a masked IP entirely separate from your real one. If a service or individual pings for your IP, all they will see is the VPN address. This protects a whole lot more than just your incoming and outgoing data.